Well Ladies, I did it. I finally finished my Prairie Schooler Village number 15. This has been one of my favorite stitches! I just love Prairie Schooler and now I think I may used overdyed flosses on some of my other Prairie Schooler charts that I plan to stitch in the near future. It took me three months to stitch this piece in a rotation of six pieces. Of course once we stitchers finish a piece we are on the hunt to find another chart that tickles our fancy!! I found a cute clip on You Tube entitled Happy Stitching Song. I tried to link it here without success but if you are interested do a search for it. A young lady who is a stitcher and a singer did a parody of Happy Working Song from Enchanted. She has a lovely voice and it was very entertaining if you are a stitcher. Amazing! You did a beautiful job on this. Arlene, Love your PS stitch, it is lovely! Worth waiting 6 months to get it done in rotation. Don't you love overdyed threads? It's hard to tell from the photo, did you use them on this project? I LOVED the Stitching Song! She is adorable and has a lovely voice and the lyrics are perfect....what a cheerful morning start. Thanks for telling us about her song. The village is beautiful. It did turn out so well. In the case of the village, the threads did add a lot. Trust your instincts. Congratulations on your Village finish! I like the use of the overdyed floss that you used. They provided subtle shading, but keeping with the PS look. I look forward to seeing what you put in its place in your rotation. Enjoy your weekend! Wow! That is really beautiful. This would be my favorite design of all you've done! Happy stitching! You always amaze me! I'm still plugging away on my Christmas project! Arlene, your work is always beautiful but this one really does stand out! I am so envious of you stitchers!! I wish I had the patience for it. Beautiful! 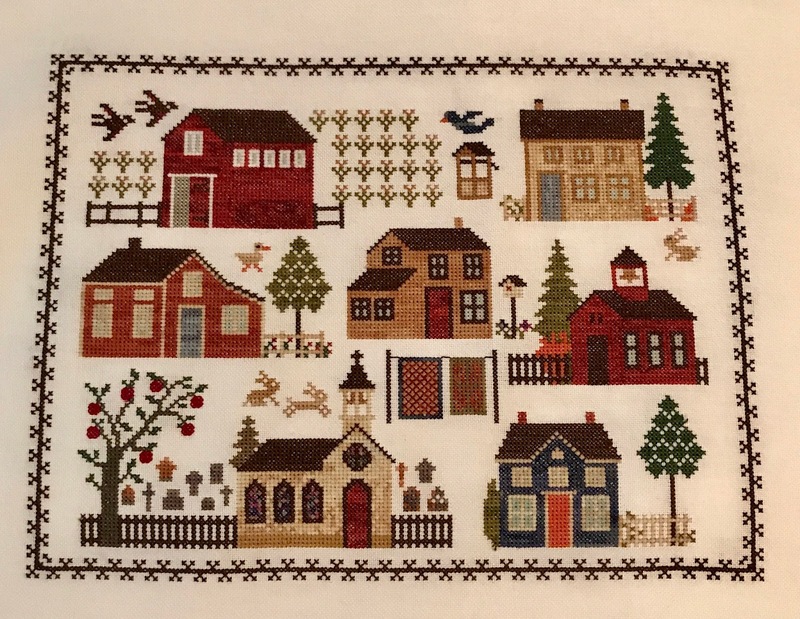 Love your village stitching!!! You have inspired me once again!